NBC has set the premiere dates for its 2017 summer primetime lineup which will feature four new series as well as the return of America’s Got Talent, American Ninja Warrior, Hollywood Game Night, Spartan: Ultimate Team Challenge, The Carmichael Show, The Night Shift, and The Wall. Making their debut this summer are World of Dance featuring Jennifer Lopez, Derek Hough, Ne-Yo, and host Jenna Dewan Tatum; Midnight, Texas, a new thriller starring Dylan Bruce, Arielle Kebbel, and François Arnaud; Marlon, loosely inspired by the life of Marlon Wayans; and Little Big Shots: Forever Young with seniors showing off their talents. NBC will also add a four episode run of Saturday Night Live: Weekend Update starring Colin Jost and Michael Che to its summer schedule beginning August 10th. “THE CARMICHAEL SHOW” — WEDNESDAY, MAY 31 AT 9 P.M.
“AMERICAN NINJA WARRIOR” — MONDAY, JUNE 12 FROM 8-10 P.M.
“SPARTAN: ULTIMATE TEAM CHALLENGE” — MONDAY, JUNE 12 FROM 10-11 P.M.
“LITTLE BIG SHOTS: FOREVER YOUNG” — WEDNESDAY, JUNE 21 FROM 8-9 P.M.
“THE WALL” — THURSDAY, JUNE 22 FROM 8-9 P.M.
“THE NIGHT SHIFT” — THURSDAY, JUNE 22 FROM 9-10 P.M.
“MIDNIGHT, TEXAS” — TUESDAY, JULY 25 FROM 10-11 P.M.
“HOLLYWOOD GAME NIGHT” — MONDAY, AUG. 7 FROM 10-11 P.M.
WORLD OF DANCE – In partnership with preeminent global dance brand World of Dance, the series brings the world’s elite dancers together to compete in epic battles of artistry, precision and athleticism for a life-altering prize of $1 million. Solo dancers will compete against duos and crews in an unlimited range of dance including hip-hop, popping, locking, tap, ballet, break dancing, ballroom, stomping and more. Jennifer Lopez, NE-YO and Derek Hough will be at the judges table with Jenna Dewan Tatum set as host/mentor. AMERICA’S GOT TALENT – Following the show’s most viewed season in five years where the finale came down to 13-year-old singing sensation Grace VanderWaal winning over spellbinding illusionist duo The Clairvoyants, America’s Got Talent is back for its 12thseason with creator and judge Simon Cowell, Mel B, Heidi Klum and Howie Mandel, as well as new host Tyra Banks. America’s Got Talent has reigned as television’s #1 most-watched summer alternative series for each of its 11 seasons on the air and last summer surged to its highest adult 18-49 average (a 3.0 rating) in three years and most-watched season (13.5 million viewers) in five years. THE CARMICHAEL SHOW – Inspired by the life of comedian Jerrod Carmichael, the series follows Jerrod and his opinionated North Carolina family as they navigate topics that all families face in America today. Jerrod often finds himself debating such issues with his old-school father, Joe (David Alan Grier); his devoutly religious mother, Cynthia (Loretta Devine); his fiancée, Maxine (Amber Stevens West); his social media-loving brother, Bobby (Lil Rel Howery); and Bobby’s outspoken almost-ex-wife, Nekeisha (Tiffany Haddish). And somewhere in the middle of all of their disagreeing is the heart of this family. AMERICAN NINJA WARRIOR – The Emmy Award-nominated American Ninja Warrior returns for its sixth full season on NBC. Matt Iseman is back as host, along with Akbar Gbajabiamila and co-host Kristine Leahy. The action-packed series follows competitors as they tackle a series of challenging obstacle courses in both city qualifying and city finals rounds across the country. Those that successfully complete the finals course in their designated region move on to the national finals round in Las Vegas, where they face a stunning four-stage course modeled after the famed Mt. Midoriyama course in Japan. The winner will take home a grand prize of $1 million. This season the show will make stops in Los Angeles, Calif.; San Antonio, Texas; Daytona Beach, Fla.; Kansas City, Mo. ; Cleveland, Ohio; and Denver, Colo., before heading to Las Vegas for the national finals. SPARTAN: ULTIMATE TEAM CHALLENGE – Inspired by Spartan Race — the creators of the world’s most demanding obstacle course races — Spartan: Ultimate Team Challenge raises the bar on team competitions. Groups of friends, families, co-workers and more must work together to test their determination, endurance and will. Teams of five will compete on one the most demanding courses ever devised and will have to push through the pain to win $250,000. LITTLE BIG SHOTS: FOREVER YOUNG – Following up on the phenomenal success of Little Big Shots, in which kids brought their amazing talents to a primetime audience, Little Big Shots: Forever Young is where young-at-heart seniors will showcase their hidden talents, vibrant personalities and incredible wisdom. As the #1 new series last season among total viewers and the most watched new alterative show in six years, Little Big Shots showcased the talent and comedy of the very young. Now the spotlight turns to America’s seniors, where Harvey will showcase undiscovered rare talents and hysterical encounters with musicians, singers, dancers and every form of “elderkind” in the country. With many years of experience and wisdom, these seniors are sure to delight the audience with their strong opinions, incredible talent, and heartwarming stories. THE WALL – With more than $12 million on the line every night, and up to $3 million on a drop at four-stories high, The Wall was built for one purpose — to change everyday people’s lives in an instant. The Wall offers a pair of deserving teammates life-altering cash prizes. The rules are simple: Get a question correct and a green ball will fall down the wall and add the value of the slot to the players’ winning total. Miss a question and an ominous red ball will fall and deduct the value from the team. Teammates have to work together to build a huge cash prize. THE NIGHT SHIFT – Doctors, nurses and the medical staff at San Antonio Memorial Hospital will be busier than ever during the fourth season of the fast-paced medical drama The Night Shift. The cast includes Eoin Macken, Jill Flint, Brendan Fehr, Robert Bailey Jr., JR Lemon, Tanaya Beatty and Scott Wolf. 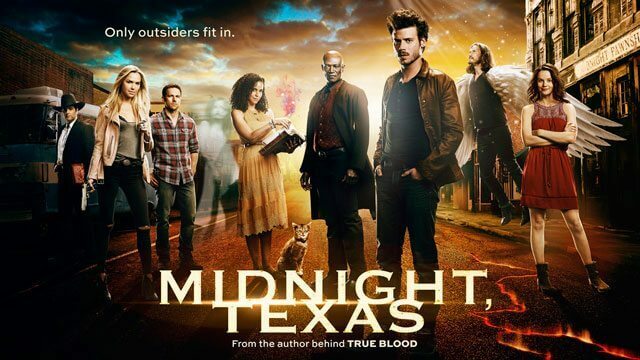 MIDNIGHT, TEXAS – Based on the best-selling book series by Charlaine Harris (author of the novels that inspired True Blood), Midnight, Texas stars François Arnaud as Manfred, a charming, powerful psychic who can communicate with spirits and finds safety in Midnight surrounding himself with both human and supernatural allies. Midnight is also home to Bobo, proprietor of Midnight’s local pawn shop (Dylan Bruce); Fiji, a witch who owns the local wiccan shop (Parisa Fitz-Henley); Olivia, a mysterious assassin with a weapon for every occasion (Arielle Kebbel); Joe, an angel who knows all of Midnight’s secrets having been around for millennia (Jason Lewis); Lemuel, a wise vampire with a long history in Midnight (Peter Mensah); Creek, an aspiring writer with big dreams (Sarah Ramos); and Rev. Emilio Sheehan, who can’t resist the pull of a full moon (Yul Vazquez). HOLLYWOOD GAME NIGHT – Hollywood Game Night, hosted by Emmy Award and Golden Globe winner Jane Lynch, returns for a fifth season with celebrities such as Sterling K. Brown, Chrissy Metz and Justin Hartley from This Is Us, and Ben Feldman, Lauren Ash and Nico Santos from Superstore, as well as Michael Bolton, NE-YO, Natalie Morales, Mike Colter, Chris Hardwick, Margaret Cho, Gabby Douglas, Matt Iseman, Taye Diggs, RuPaul and many more who will join in the fun as they face off in hilarious party games. In the series, two contestants are transported from their everyday lives into a once-in-a-lifetime night of fun and celebration as they step beyond the velvet rope and rub shoulders with some of their favorite celebrities and compete for the chance to win up to $25,000. This season features new party games and the winning contestant will be able to choose two celebrities to help them win the grand prize. MARLON – Loosely inspired by the real life of star Marlon Wayans, this update to the classic family comedy centers on a loving (but inappropriate) father committed to co-parenting his two kids with his very-together ex-wife. While his misguided fatherly advice, unstoppable larger-than-life personality and unpredictable Internet superstardom might get in the way sometimes, for Marlon family really always does come first — even if he’s the biggest kid of all. The cast includes Marlon Wayans, Essence Atkins, Bresha Webb, Diallo Riddle, Notlim Taylor and Amir O’Neil.